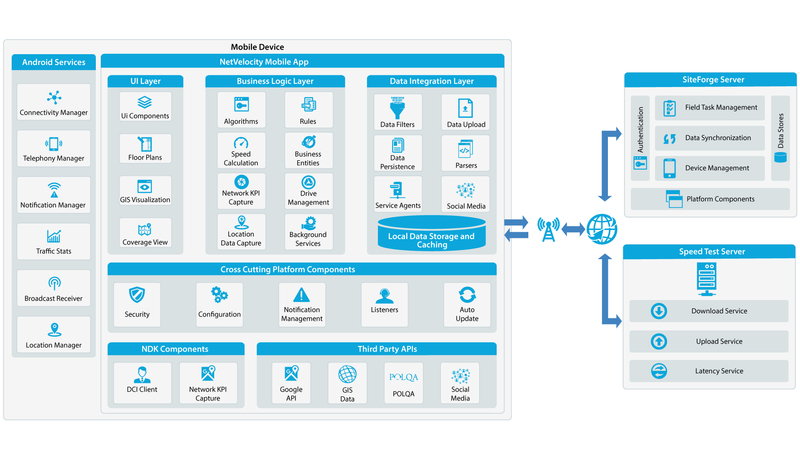 NetVelocity is an advanced unified mobile application that offers host of features to help mobile device users and operators to measure, analyze, share and compare the network performance. It is engineered with a one-click functionality to capture on the ground coverage and enables competitive benchmarking. This multipurpose tool collates inputs from multiple data sources such as the data received by measuring on device user experience and performance of network resources, using which it provides near real-time insight into network coverage and customer experience. The DCI Layer 3 enterprise solution facilitates in capturing LTE, 3G and 2G network parameters to measure the actual wireless carrier network performance. It synchronizes the captured data in background for real-time analytics and supports device locking. End users can perform the speed test, share results and get a clear picture of network conditions via IP tools, Wi-Fi Analyser and Live Drive capabilities. NetVelocity is a complete solution for network operators to get unified view of customer experiences. NetVelocity application has inbuilt passive monitoring mechanism that captures LTE, 3G and 2G network parameters, location and network type, call events like call drop and handovers even when the application is idle or closed. NetVelocity is a mobile application that facilitates end users in performing multiple tests to gain real-time insights of the carrier performance including accurate values of KPIs and all the network parameters like upload/download speed, ping, latency, etc.